©2014 Mark Von Holden / Mark Von Holden Photography. ©2014 Mark Von Holden / Mark Von Holden Photography. All Rights Reserved. Dread Scott, 2014, at the Manhattan Bridge Archway Plaza, DUMBO, Brooklyn. On the Impossibility of Freedom in a Country Founded on Slavery and Genocide was a performance piece by artist Dread Scott engaging with the legacy of racism in the United States and pointing to the continuing struggles faced by minorities across the nation. The Impossibility of Freedom in a Country Founded on Slavery and Genocide took place underneath the Manhattan Bridge Archway, located at Water Street between Anchorage Place and Adams Street in DUMBO, for one time only on Tuesday, October 7, 2014 at 1pm in the afternoon. 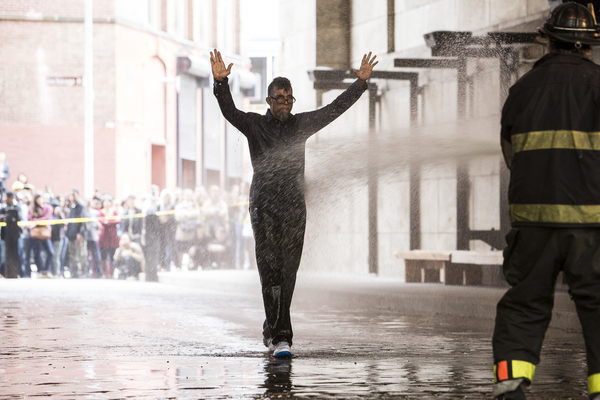 The performance, in part, referenced the 1963 Civil Rights struggle in Birmingham Alabama, during which city officials used high-pressure water canons to disperse non-violent protesters and bystanders in an effort to maintain segregation and legalized discrimination. On the Impossibility of Freedom featured Dread Scott engaged in a Sisyphean attempt to walk into the battering force of water jetting from a fire hose. While the performance was highly reminiscent of crowd control tactics used in the past, it also served as a statement on a myriad of socio-cultural issues that affect a diverse group of marginalized individuals through discriminatory policies in immigration, criminal justice, welfare and education. This piece also reflects on present-day struggles against racism and the struggle for equality, as those demonstrated by the protests and then the militarized police response in Ferguson, Missouri. Impossibility of Freedom from More Art on Vimeo. Dread Scott is an interdisciplinary artist whose work is exhibited across the US and internationally. For three decades he has made work that encourages viewers to reexamine cohering norms of American society. His art has been exhibited/performed at MoMA/PS1, Pori Art Museum (Finland), BAM (Brooklyn Academy of Music) and galleries and street corners across the country. He is a recipient of grants form Creative Capital Foundation and the Pollock Krasner Foundation and his work is included in the collection of the Whitney Museum.